Graduate students across the nation dodged a financial bullet Wednesday, even as dozens of prominent universities took a hit in the form of a new tax on university endowments and other investment income. The tax will weaken financial aid, faculty and research initiatives, and other institutional programs that support students, professors, and medical and scientific studies. Harvard President Drew Faust, who worked against the graduate and endowment taxes, warned that the new endowment tax represents an unprecedented attack on the tax-exempt status of nonprofits and charities because it taxes, for the first time, income for such an institution’s core mission — in this case, education. The endowment tax is included in the $1.5 trillion tax package passed by the U.S. House and Senate, which was billed as a massive tax cut for the country, but whose earlier versions included increased taxes on higher education to help pay for cuts to corporate and income taxes. Among the most controversial aspects were provisions that would have taxed as income free tuition provided to graduate students and removed the ability to deduct student loan interest from income taxes. In response to an outpouring of protest from university presidents, graduate students, and some lawmakers, the final version dropped those measures but nonetheless retained the 1.4 percent tax on net investment income for institutions whose investment assets are greater than $500,000 per student. Faust, who has called the tax increases “a blow at the strength of American higher education,” hailed the good news for graduate students, who play critical roles in both the classroom and the laboratory. But Faust said she was deeply troubled by the endowment tax — to be levied on private institutions with 500 or more students beginning next year. “I am glad to see adjustments in the tax bill, notably the preservation of tax-free tuition remission for graduate students and the student loan interest deduction, which will enable undergraduate and graduate students to pursue the life-changing path of higher education without the additional financial burden imposed by previous proposals,” Faust said. “However, I am deeply concerned that the adoption of an unprecedented excise tax on charitable organizations that targets certain colleges and universities will weaken our ability to support students and research. The provision will constrain the resources that enable us to provide the financial aid that makes college more affordable and accessible and to undertake the inquiries that yield discoveries, cures, innovation, and economic growth. The tax on university endowments and other investment income is expected to raise $1.8 billion over 10 years, according to the Congressional Joint Committee on Taxation. It will affect about 35 institutions, including Princeton University, the University of Notre Dame, Massachusetts Institute of Technology, Yale University, Stanford University, the University of Chicago, and the California Institute of Technology. Faust has been a vocal opponent of the provisions to increase costs on colleges and universities, arguing that higher education is one of the few reliable ways for Americans to climb the economic ladder, and that discoveries that come from university labs are an important factor underpinning both the nation’s economic growth and its international competitiveness. In addition, higher education officials say that taxing endowments at a time when federal research funding is uncertain only exacerbates tightening budgets at their institutions. Endowment investment income varies annually, but in fiscal 2017 the new levy would have cost Harvard roughly $43 million. With endowment income funding about a third of the University’s budget each year, the new tax presents Harvard officials with a choice between meeting their responsibility to donors to maintain the endowment’s health into perpetuity, and slashing funds to programs such as financial aid. John Y. Campbell, Harvard’s Morton L. and Carole S. Olshan Professor of Economics, said he was relieved that graduate student tuition waivers would remain tax-free and that the student loan interest deduction was preserved, because the loss of those benefits would have been felt across higher education. He was also troubled by the precedent set by the endowment tax and by the “distortion” effects it could have. Once enacted, it will be easier for future Congresses to increase the tax rate or expand it to more institutions, Campbell said. The tax’s design is also problematic, he said, because it can distort the behavior of institutions hovering close to the tax threshold. Those with 498 students instead of 500, for example, pay no tax, nor do those whose investment assets total $499,900 per student instead of $500,000. That creates a perverse incentive for institutional leaders to work to avoid paying the tax that policymakers didn’t anticipate. Mary Sue Coleman, president of the Association of American Universities and former president of the University of Michigan, said in a statement that although she was relieved that harmful provisions had been removed from the final measure, she’s still concerned about its impact on students, their families, and colleges and universities. 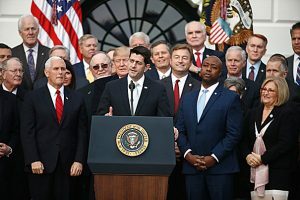 The House first approved the bill, which was hammered out last week in a House-Senate Conference Committee, on Tuesday afternoon largely along party lines, 227–203. The Senate passed the legislation that evening, also along party lines, 51–48. But a change in the bill required by Senate rules meant that the measure had to return to the House Wednesday to ensure that both chambers passed identical versions. The House approved the bill Wednesday, 224–201, sending it to President Trump to sign into law. Among the bill’s other higher education provisions, the final measure dropped two potentially costly provisions in the House version. One would have eliminated the tax-exempt status of education benefits for university faculty, staff, and their family members, and required tuition remission to be taxed as income. The final bill also dropped a House-proposed change to how colleges and universities finance construction, maintaining their ability to finance projects through tax-exempt, private-activity bonds. Other provisions that could have affected universities and colleges included changes to how business income is calculated, and an increased standard deduction for individual income taxes, which could reduce charitable giving. Harvard graduate students Alana Van Dervort and Adam Mastroianni were among those fighting the graduate student tax. Van Dervort, a grad student in biological and biomedical sciences, sent members of the House-Senate conference committee a petition containing 5,500 names opposing the changes. Mastroianni, a graduate student in psychology, worked with graduate student groups on campus against the changes and wrote a humorous song to call attention to the bill. Mastroianni said he was relieved that the tax on graduate student tuition waivers was dropped. He was concerned that the proposal would have hurt him financially, though he added that he could have “white-knuckled through.” He was more concerned, he said, about graduate students with families and small children, for whom finances are even tighter. Van Dervort said she had always been proud of what she had achieved despite her family’s modest means, but now she found herself questioning whether the authors of the graduate tuition tax proposal viewed stories like hers the same way. “Do you think an education beyond four years is valuable, and do you think it should be only available to the wealthy?” Van Dervort wondered. She said many of her fellow graduate students are mainly voicing relief, but they’re also re-evaluating assumptions about the societal value of their work. em>Originally published by Harvard Gazette with permission.